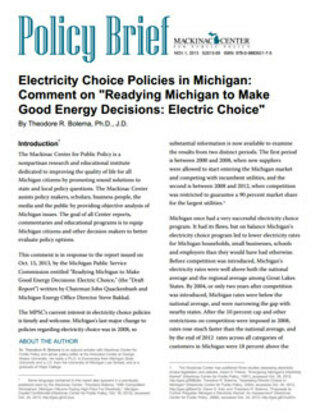 The Draft Report has the potential to be a helpful contribution to the public debate on future electricity choice policy for Michigan. The first draft, however, falls short in ways that should be corrected before a final report is made available to policymakers. Michigan can recapture the benefits of competition in electricity supply by removing the 10 percent cap and undoing other restrictions on electricity sales that allow its largest utilities to charge unnecessarily high prices to Michigan's residents, businesses and government service providers. Michigan should once again embrace opening its electricity market to more entrants to see if they can perform better than the incumbent firms, which will drive down prices for electricity consumers. Michigan allowed such competition to start to emerge during its brief era of Full Customer Choice, and the early results were promising. The initial results from a more tightly regulated and protectionist experiment have been by contrast disappointing.